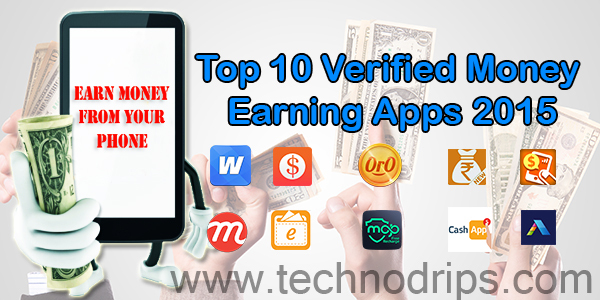 I'm already discussed many mobile Top-Up earning apps as well as real money earning apps in my previous blog posts. 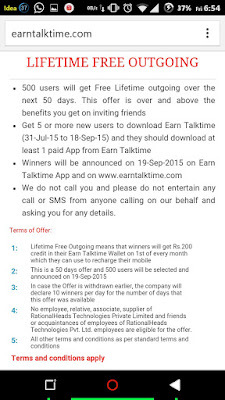 Now one of the app from the list named “Earn Talktime” is running a contest which giving away 500 users lifetime outgoing calls for free, that is one winner will get Rs 24,000/- in his/her wallet, which you can redeem to prepaid/postpaid mobile bills and DTH recharges. Referral earning from this app is big as compared to other money earning apps, Earn Talktime offers Rs130/- for each friends you invite and join with this app. 2. 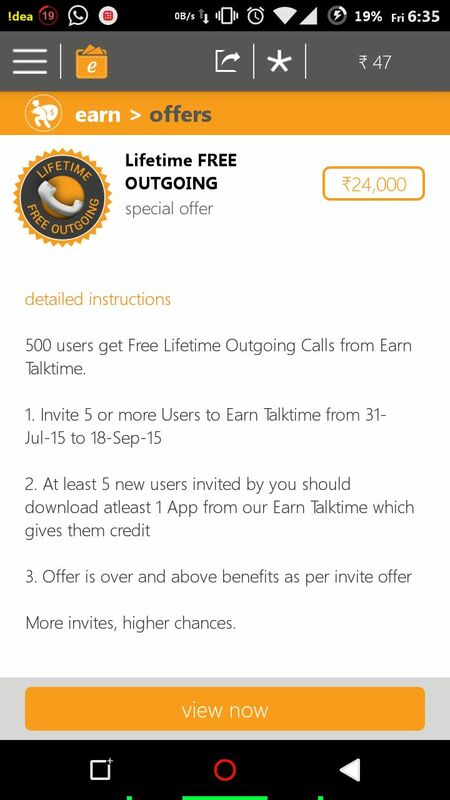 You need to invite at least 5 users with your referral link and they must download atleast 1 App from earn talktime which give them credits. Hurry!! 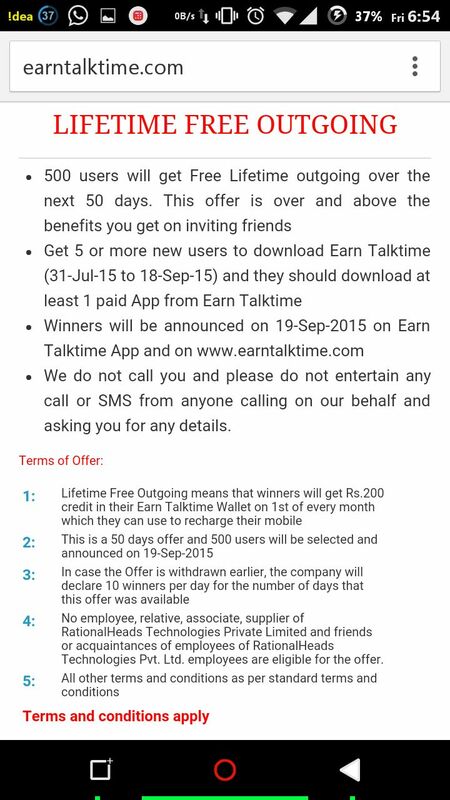 Download EARN TALKTIME APP and win Huge!! 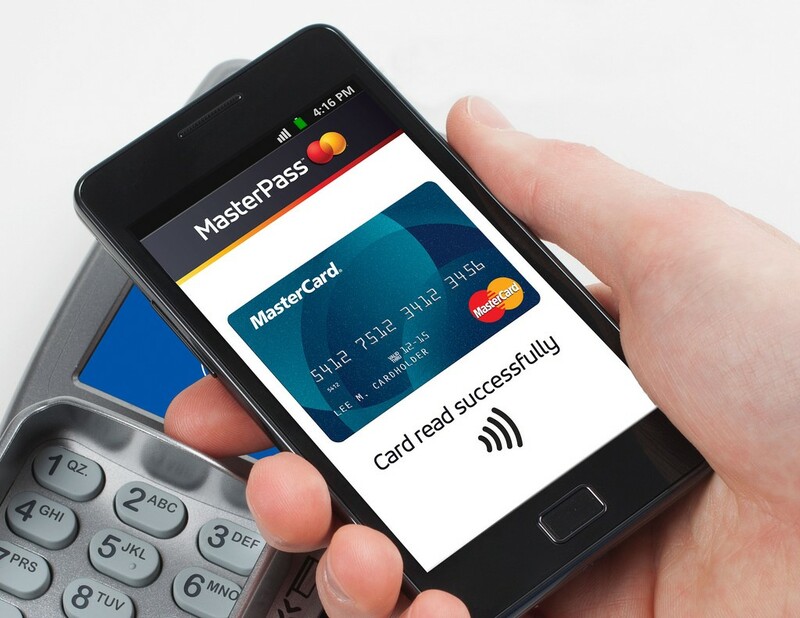 In 2015 mobile payments are very likely to go mainstream. Through Apple pay and Google wallet you can use your phone to make transactions almost anywhere from your local neighborhood store to renowned retail chains. Today every app is recreated 20 times in different languages to facilitate people from different countries. With mobile payments going mainstream there is a possibility that app developers will develop apps that will help tourists in a foreign country to make payments without having to go to banks to exchange currencies. The biggest hold up in making mobile payments commonly accepted is the fact that people are scared they won’t be safe. With new technologies come new fears and incidents like those at Target have made people less inclined to share their bank account information. Due to this reason companies will work very hard to gain people’s confidence so that mobile payments can become widely accepted among people. And the company that best executes this plan is bound to gain the most profit. Due to successful validation of Starbucks mobile payments it is very likely that mobile payments will go mainstream this year. Starbucks’ products are very commonly and widely consumed. So introducing mobile payments at Starbucks is a very good strategy to familiarize people with how mobile payment technology works. Let’s face it people always go for the things that provide them with the most convenience and making payments through your smart phone is way convenient than pulling out your credit card and taking your wallet to every other place you go. As more and more people get used to making mobile transactions the better it is for the companies that provide this service. Once people become used to these new payment methods it would inevitably give the power to consumers. This would mean that they would get to choose the way they want to make payments. And if merchants want their business to flourish they’ll have to let the consumers decide their payment methods instead of making this choice for them. Mobile wallet technology has been extensively discussed throughout the years but 2015 may be the year it finally becomes widely accepted. The concept has become popular due to services like Apple pay and Google wallet. The big credit card companies have gone on board with the idea of enabling their consumers to be able to use this service. 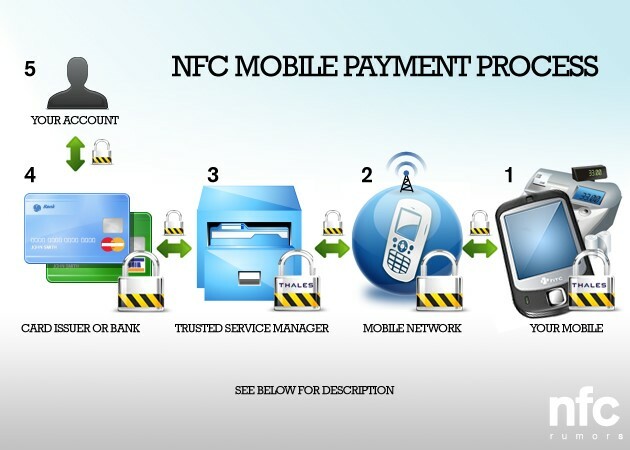 Whereas the big telecommunication companies have started making NFC enabled phones for this purpose. Retailers are also delighted to add value to their consumers’ shopping experience with the mobile wallet technology as not only you can make payments through your phone but gift cards and receipts can also be added on your phone. All in all if people didn’t have security concerns mobile payments would’ve become mainstream a long time ago. This article was written by Syed Irfan Ajmal. He is a serial entrepreneur, a columnist and a certified inbound marketer. The Internet is indeed an excellent source for almost anything. You can download and purchase songs, movies, and other random videos you wish to watch during your most idle times. Also, you can also freely communicate with your peers and family members via different forms of social networking sites and even through emails. Indeed, the Internet is a place where we can get all of our digital needs. However, the Internet can also be the source of your computer’s downfall, as the Internet can also be the gateway for viruses to attack and invade your device. Virus attacks can happen at any time and when you least expect it. Also, the type of virus that invades your computer can vary and can have different effects on your computer; it could be a Trojan or a recycler virus. 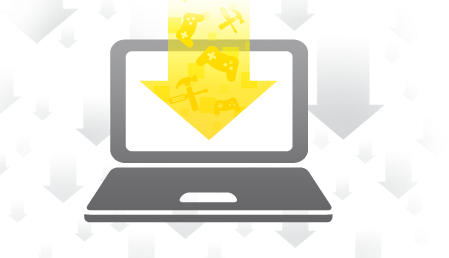 Downloadable programs from the Internet are one of the possible sources of virus attacks. Also, this is also the most common cause of welcoming viruses into your device. They can come from unreliable websites and Internet newsgroups. Any executable files downloaded from the net is the primary source of viruses entering your devices. Files having the extension of “.com” and “.exe” are the known couriers of different types of viruses. If you wish to download these kinds of files from the Internet, make sure you are downloading from a reliable website. Also, do a thorough scan of the file first before initializing the installation process. 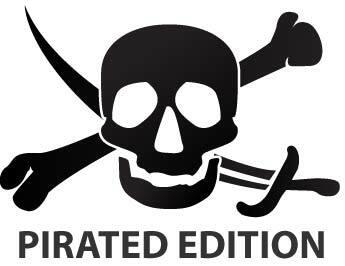 Installing an illegal version of any programs proves to be another source of virus attacks. Most Internet users want to use a particular software program without having to spend for the product, resulting other users to upload their cracked version of those products. These programs can also contain bugs that are challenging to find and hard to remove. Therefore, it is advisable to download programs that require you to pay and also from legitimate websites. 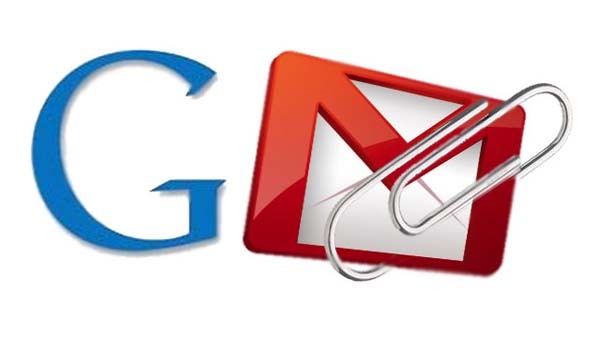 The most popular source for virus attacks is email attachments. When handling and opening any received emails, you should be careful in handling them, especially if that email comes from an anonymous source. The right solution to this problem is installing an anti-virus software that assumes the prime role of eliminating an inevitable virus attack. It is crucial to scan the email first before opening it, even though that email may come from your peers. You may never know, maybe they sent you an attachment that may contain viruses. Of course, there is no denying the fact that the Internet is the most common source of virus infection. Even if you would try to stop accessing the Internet now for the rest of your lives, your computer is still prone to welcome an unexpected virus attack in your system. Every click and downloads you do can invite an inevitable virus attack that can bound to happen at any time. Therefore, it is crucial that you consider the site you are visiting online, make sure that the site is legitimate and reliable. Besides from the sources mentioned above for virus attacks, file sharing websites can also be considered to be sources of viruses to attack your device. It is better that you delete the downloaded files from these sites to eliminate the possibility of a virus attack. Your computer is the biggest investment you made, therefore taking good care of your device should be the top most priority of your to-do-list. 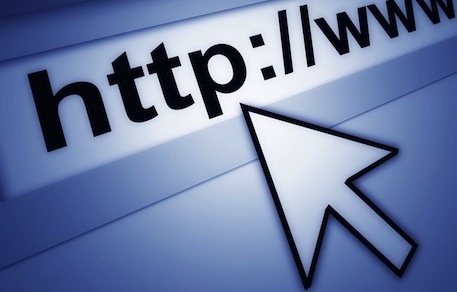 One way of doing so is to surf the Internet and download properly only from reliable websites. Do so and you will decrease the chance of viruses attacking your device. Patrick is currently a teacher, a Science teacher to be exact, as well as a writer. At his spare time he’s in front of his computer playing his favourite online games. He previously worked for several companies as a part of technical support team. He’s currently writing for Stemp Systems whose sole purpose is to provide IT support services in New York City.